In this article, we'll discuss the primary cause of thyroid related hair loss- low ferritin levels. We'll also look at some of the main causes of low ferritin and what you can do to improve your ferritin iron levels and fix your hair loss. As frustrating as fatigue, cold hands and feet, and brain fog were, there was no symptom of hypothyroidism as devastating to me as hair loss. Thin, dry and frizzy, my hair would constantly shed. I was embarrassed by my thinning hair and, dare I admit it, envious of women who had a healthy, full head of hair. 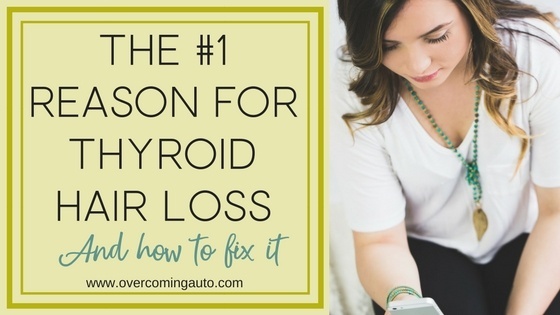 At one point, after a diagnosis of Hashimoto's Thyroiditis, I had a bizarre "thyroid storm" which led to rapid weight loss, heart palpitations- and my already thinning hair began coming out in handfuls. Not so fun. Even after changing my diet and improving my lifestyle to heal my thyroid, I can't say I magically experienced hair growth worthy of shampoo commercials. So I started researching, looking for answers to fix my hair loss and my thyroid. What I discovered was that underlying imbalances in my gut were interfering with the absorption of nutrients that were critical to optimal thyroid function- and to hair growth. One key nutrient which can cause hair loss is iron, or more specifically low ferritin. (1) Ferritin is a protein which stores iron in the body. Iron has the important job of transporting oxygen in the blood. Keeping some stored away ensures you're never without this vital mineral. So what happens when you start running low in stored iron? While low iron can spell disaster for your health, leading to fatigue, headaches, dizziness and shortness of breath, it can also take a toll on your hair. In fact, because hair is one of the fastest growing tissues in your body, it's one of the first places where signs of an imbalance can show up. Low iron levels translate into a shorter growth phase for the hair follicle, resulting in an increase in overall shedding. Women with low ferritin may also complain that their hair simply “won’t grow,” never reaching a length past their shoulders. If you are experiencing thyroid related hair loss, including overall shedding and thinning of the hair, dry, brittle hair or hair that doesn't grow beyond shoulder length, it's worth getting your ferritin levels checked to find out if low iron is at the root of your hair loss. One key nutrient which can cause hair loss is iron, or more specifically ferritin. 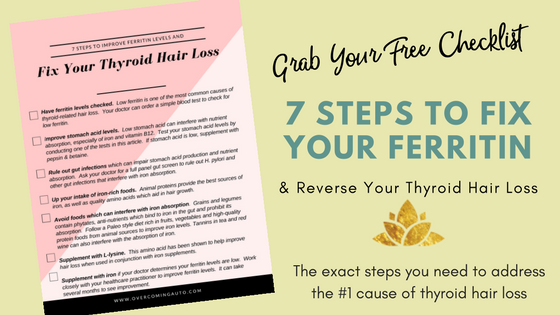 This is considered by many functional practitioners to be the most common reason for thyroid hair loss, so this is one nutrient deficiency you don’t want to mess with. Ferritin is a protein whose job it is to hold onto iron stores in the body. Mostly stored within the cell, there is fairly litte ferritin circulating in the blood. When ferritin levels are low, its a sure sign that your body’s store of iron is low as well. This is bad news for your hair since iron has a direct effect on hair growth. Low iron levels translate into a shorter growth phase, resulting in an increase in overall shedding. Women with low ferritin may also complain that there hair simply “won’t grow,” never reaching a length past their shoulders. Low ferritin is diagnosed through a simle blood test, however it’s important to note that testing for ferritin is not the same thing as testing for iron most doctors do when they order a Complete Blood Count (CBC). Most physicians will test your iron levels by checking your hemoglobin and hematocrit levels. If these blood tests show levels of iron, you will likely be diagnosed with anemia. However, you can be told your iron levels are "normal" and still have low ferritin levels. Because low levels of ferritin are the first telltale signs of low iron, it’s unfortunate that testing for ferritin is often overlooked. You will need to make sure when asking your doctor for this test, that you specifically ask to have your ferritin levels tested and not just your iron levels or there’s a good chance it won’t get done. Also note that there is a difference between normal ferritin levels and optimal levels of ferritin- and you will definitely want to make sure your ferritin levels are optimal in order to reverse your thyroid hair loss. Normal levels are considered 50 to 100 mcg/L. However, 70 to 80 mcg/L is considered optimal for hair growth- the right amount to see improvement in your hair. You'll need to be patient, though. It can take up to 6 months for ferritin levels to increase. Consider taking iron with L-lysine, an amino acid we’ll discuss in just a moment, for best results. A word of caution. It might be tempting to think that if a little bit of iron is good for your hair, a whole lot of iron would be better. Iron can be toxic at high levels, so it’s important to get this one checked out through a simple blood test before self-diagnosing and self-treating. When iron levels are too high, it can lead to damage of the liver and other organs, heart problems, as well as diabetes. That’s not a good trade off for having hair worthy of a shampoo commercial, so do yourself a favor and have your iron levels tested before supplementing. Low ferritin is diagnosed through a simle blood test, however it’s important to note that ferritin is not the same thing as testing for iron most doctors do when they order a Complete Blood Count (CBC). Most physicians will test your iron levels by checking your hemoglobin and hematocrit levels. If these blood tests show levels of iron, you will likely be diagnosed with anemia. However, you can be told your iron levels are normal and still have low ferritin levels. Because low levels of ferritin are the first telltale signs of low iron, it’s unfortunate that testing for ferritin is often overlooked. You will need to make sure when asking your doctor for this test, that you specifically ask to have your ferritin levels tested and not just your iron levels or there’s a good chance it won’t get done. Also note that there is a difference between normal ferritin and optimal levels of ferritin- and you will definitely want to make sure your ferritin levels are optimal in order to reverse your thyroid hair loss. Normal levels are considered 50 to 100 mcg/L. However, 70 to 80 mcg/L is considered optimal- the right amount to see improvement in your hair. Note however, that it can take up to 6 months for ferritin levels to increase, so be patient with this one and consider taking iron with L-lysine, an amino acid we’ll discuss in just a moment, for best results. A word of caution. It might be tempting to think that if a little bit of iron is good for your hair, a whole lot of iron would be better. Iron can be toxic at high levels, so it’s important to get this one checked out through a simple blood test before self-diagnosing and self-treating. When iron levels are too high, it can lead to damage of the liver and other organs, heart problems, as well as diabetes. That’s not a good trade off for having shampoo commercial worthy hair, so do yourself a favor and have your iron levels tested before supplementing. So, now that we know how ferritin affects hair growth, it's important to understand why your ferritin levels might be low in the first place. Pinpointing the underlying causes of nutrient deficiencies will help correct the problem at the source, instead of wasting valuable dollars on expensive supplements that you may not be able to absorb. When it comes to absorbing the nutrients which are most important for hair health- iron and vitamin B12- your stomach acid holds all the cards. It may come as a bit of a suprise to learn that low stomach acid is at the root of your thyroid hair loss. After all, stomach acid has gotten a bad rap from the makers of Proton Pump Inhibitors and other medications aimed at reducing heartburn and acid reflux. Stomach acid is there for a reason. It’s main job is to help you digest the protein in the foods you consume and break apart the foods you eat so you can absorb the nutrients found in them. Stomach acid, also known as hydrochloric acid (HCl), is one of the most acidic substances around, boasting a pH of 1.5 to 3.5, so it's perfectly suited to break down the tough proteins that bind to iron in the diet. As you now know, low ferritin is the most common culprit in thyroid related hair loss. It’s where iron hangs out when it’s not being actively used to transport oxygen via your red blood cells. So it would make sense that if ferritin is one of the most likely causes of hair loss, we should make sure that we are actually absorbing iron from the diet to combat this problem. And without adequate stomach acid, that won’t happen. In order for iron to be absorbed in the small intestine, it must be mixed with stomach acid. The acid in your stomach is primarily responsible for breaking the chemical bonds that bind the iron molecule to food proteins. Without this process, the iron won’t be available for digestion. And even when iron is broken apart from food, it still relies on stomach acid to aid in absorption. Iron must be disolved in solution- preferrably a highly acidic one, in order to be absorbed. When pH levels rise above 5, as is often the case with those who have low stomach acid, iron has a difficult time remaining in solution and instead simply pass through the digestive tract. So the next obvious question to ask is, "Why is my stomach acid low in the first place?" The answer to that question frequently can be found in the digestive tract as well. When it comes to absorbing the nutrients which are most important for hair health- iron and vitamin B12- your stomach acid holds all the cards. It may come as a bit of a suprrise to you to learn that low stomach acid is at the root of your thyroid hair loss. After all, stomach acid has gotten a bad rap from the makers of hearburn medications and the doctors who presribe them. Blamed for everything from hearburn to acid reflux, stomach acid has been villified as the underlying reason everything that ails your stomach. The truth is actually quite the opposite. Low stomach acid, rather than too much, is responsible not only for heartburn and acid reflux, but a whole host of issues, both of the digestive variety ad otherwise, including hair loss. Stomach acid is there for a reason. It’s main job is to help you digest the protein in the foods you consume. Stomach acid is actually hydrochloric acid (HCl) and it’s one of the most acidic substances around, boasting a pH of 1.5 to 3.5. You’ll recall that low ferritin is the most common culprit in thyroid related hair loss. It’s where iron hangs out when it’s not being actively used to transport oxygen via your red blood cells. So it would make sense that if ferritin is one of the most likely causes of hair loss, we should make sure that we are actually absorbing it from the diet. And even when iron is broken apart from food, it still relies on stomach acid to aid in absorption. Iron must be disolved in solution- preferrably a highly acidic one. When pH levels rise above 5, as is often the case with those who have low stomach acid, iron has a difficult time remaining in solution and instead simply pass through the digestive tract undigested. H. pylori- The infection in your stomach that's ruining your hair? Your health care practitioner can pinpoint an H. pylori infection with a simple stool test. It might be worth getting a full panel stool test to check for other forms of dysbiosis while you're at it, since H. pylori isn't the only common gut infection in hypothyroid sufferers- or the only one that can lead to low iron for that matter. There are a few other reasons to consider which may be contributing to low ferritin iron levels. Women who eat a vegan or vegetarian diet are more likely to have low iron levels due to the low levels of iron in most plant foods, as well as the fact that plant based sources of iron are not as easily absorbed as animal based sources. (4). Heavy menstruation may also diminish iron stores in premenopausal women. With any significant blood loss, some iron is bound to be lost as well. Over time, this can result in an iron deficiency and low ferritin status. For this reason, you'll also want to improve your hormone health so you can improve your period and keep iron loss to a minimum. Once you've determined your ferritin status, pinpointed any underlying gut infections and improved stomach acid levels, you will want to bring your iron levels up to the optimal range for hair growth by adding iron rich foods to the diet as well and using supplements to increase iron levels. Foods rich in iron include liver, grass fed beef and sardines. While foods like lentils and spinach are often touted as being high in iron, remember that plant sources of iron contain non-heme iron, a form of iron that is less readily absorbed than animal sources, which contain a form of iron known as heme iron. That doesn't neccesarily mean you should exclude plant sources of iron from your diet. It simply means you don't want to rely solely on plant foods for your iron needs. If a blood test reveals low ferritin levels, your doctor will likely recommend supplementing with iron. Be aware that iron supplements cause digestive difficulties, including constipation and nausea, so you'll want to choose your iron supplement carefully. Many practitioners recommend iron glycinate as an easily absorbable form of iron which is also easy on the stomach. It may be listed as ferrous bisglycinate chelate on the label. There are a few key strategies to consider when supplementing with iron. Because nutrients work synergistically, you will want to be sure to consume iron rich foods and iron supplements along with those nutrients that aid it's absorption. The most noteable nutrient which aids in iron absorption is vitamin C. When vitamin C combines with iron in the digestive tract, it creates a chelated form of iron which is more easily absorbed. In fact, vitamin C may increase iron absorption by nearly three times. (5) Because vitamin C is also essential for collagen synthesis, a protein which plays a role in the health of your hair, it's one nutrient you shouldn't be without when working on fixing your thyroid hair loss. There are also a few nutrients that can inhibit the absorption of iron. Calcium and other minerals, such as magnesium, can compete with iron for absorption so it's best to take your iron supplements seperately from calcium supplements, as well as high calcium foods. Tannins, polyphenols found in tea, red wine and chocolate, are also known for their ability to inhibit iron absorption. While tannins do contribute to the health benefits of these foods, it may be best to limit the amount of tannins in the diet when you are working on improving your ferritin status and avoid eating or drinking foods rich in tannins within a few hours of taking your iron supplement. Phytates can also bind to minerals in the gut and inhibit absorption of iron. Found mainly in whole grains and beans, humans lack the ability to digest phytates. Phytates form when phytic acid binds to minerals, including iron, calcium, magnesium, zinc, and potassium, and thus making them unavailable for absorption as well. 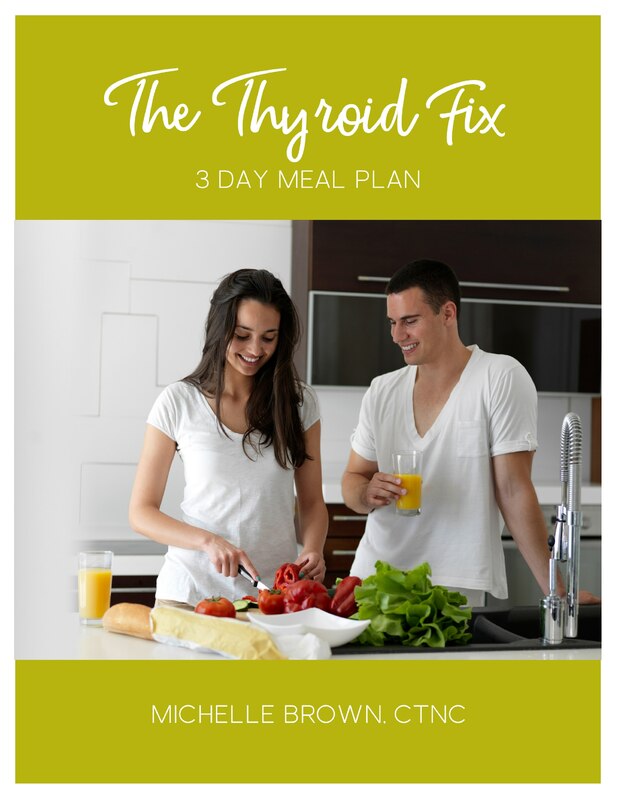 Because phytates also impair digestion in other ways, including limiting the activity of digestive enzymes, damaging the delicate gut lining and contributing to leaky gut, it's best to avoid food high in phytates when working to improve your thyroid function. As a final reminder, improving your iron status can take several months and, as you've seen from this article, invovles more than simply popping an iron pill and calling it a day. It's important to address the underlying causes of low iron status and fix your digestion in order to improve iron levels, as well as the other nutrients that are important for thyroid function and hair growth. Download the free checklist for fixing your ferritin below to help you take action in getting started. The information in this article is for educational purposes only and is not intended as medical advice. Please consult a health care professional for your specific health concerns.